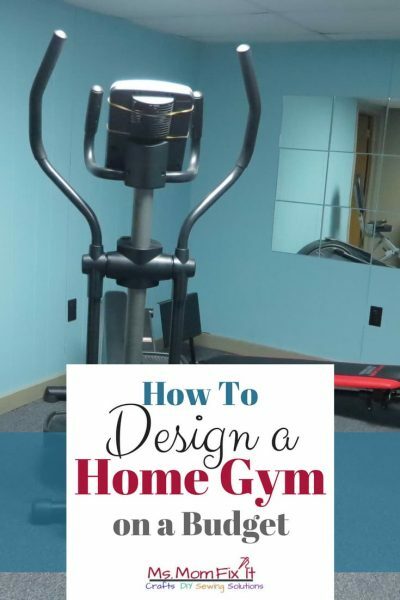 It is not too difficult to create a home gym on a budget. Although looking at home gym equipment will likely put you into sticker shock unless you are an avid athlete already. It can also be confusing when you try to figure out which equipment is best. What bells and whistles do I need? How can I maximize my space to get the equipment that is right for me? You may also want to consider the space you will be using and determine whether you need to upgrade wiring, paint, or install different flooring and ceilings. My home gym is in our basement with drop ceilings installed. My first installation into our new home gym was my elliptical. The reason I point this out is that I am just tall enough to use my elliptical without hitting the ceiling as I work out. Any user that is taller than 5’ 3” would likely have a tough time achieving a workout without a head injury in my space! Remember to style your area to your pleasing with fresh paint colors that will help motivate you. While you can certainly research paint colors, remember that whatever colors you chose should make you enjoy your workout space. You can read more about the design in my future post. 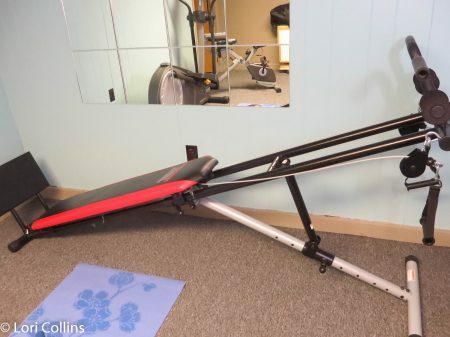 Consider these affordable equipment options for a great start on your home gym. Resistance bands are an ideal option to start a home gym. You can get them in packs that contain several levels of resistance and often come with a usage guide. Resistance bands can act as an alternative to kettlebells or weights and can also be used with a variety of workouts. Bands can be combined with Pilates, yoga, stretching exercises, flexibility exercises or strength training. The gist is that exercise bands can be used to replace free weights and more costly machines. Resistance bands take up very little room, are versatile, and are inexpensive making them a must-have for at home gyms with limited budgets. Wider and thicker bands provide greater resistance. A set is most beneficial since different muscle groups need different levels of resistance. 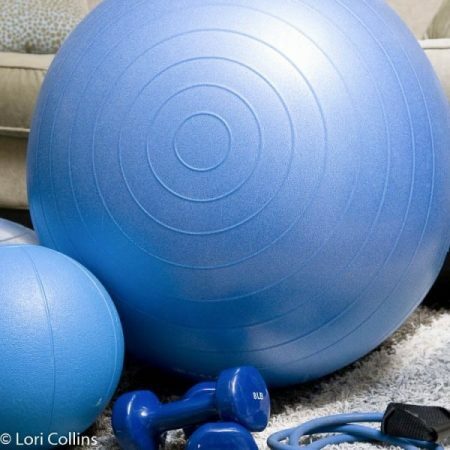 A balance ball is a great option for a home gym. The balance ball is one of the best items for a core workout. For newbies, your core is essentially the muscles in your body that stabilize and support all your movements- deep abdominal and back muscles. A balance ball will help with muscle balance, posture, and back and spine health. The gist here is that the balance ball involves mental as well as physical exercise as the ball provides an unstable base. This makes you work extra muscles, and over time, your movements become more fluid. 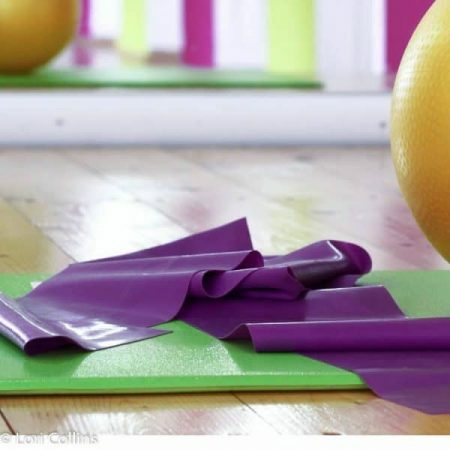 Ball based exercise can reduce stress as stretching encourages greater relaxation. There are different types of gyms available such as all-in-one and body weight. Some of these systems are portable while others are extremely heavy and have a large footprint. For the average person, a total gym is a great cost alternative to give you the benefits of a weight bench using resistance set by both your own body weight and the resistance bands on the gym. Several of these models are also easy to compact for storage. The model I chose is the Weider Ultimate Body Works. You can adjust the intensity of your workout by changing the incline of the bench. In addition to your body weight, the resistance bands also provide up to 50 lbs. of resistance. This gym provides the ability to do 50-plus exercises to define and shape your arms, shoulders, back, abs, hips, thighs, and calves. 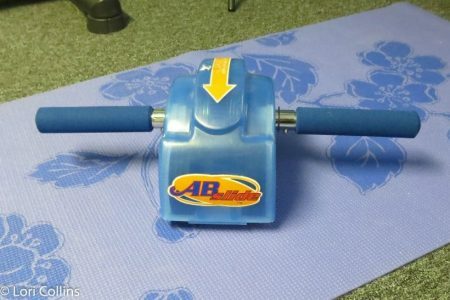 An ab wheel is a very inexpensive gym alternative. However, a novice may find this device to be akin to torture. I prefer a wheel with a built-in coil to allow assistance in the return movement. The gist is that exercising with an ab wheel requires your core muscles to work together to properly, resulting in optimal core and spine stability. Consistent use of an ab wheel will increase your stamina, improve balance, and strengthen your muscles. Hand weights are great for home-trainees who have limited space and equipment. Hand weight exercises can be more joint-friendly than barbell exercises. Dumbbells can be used for a variety of exercises and promote muscle growth. Hand weights are the most economical option for a home gym as you can buy according to your current needs and add more sizes later. If you are looking for weight loss, it is easy to dismiss hand weights as you may fear gaining too much muscle. Optimally though, you do want to promote muscle mass rather than fatty deposits. Muscle mass will help with core strength and endurance overall. A treadmill is a perfect item for a home gym. A manual treadmill is powered by the user themselves and provides an adequate workout. A motorized treadmill, however, will generally provide a better workout as you are more apt to adjust to the machine rather than allowing your body the natural breaks you will incur when your body is powering the manual model. A treadmill offers a great solution for an at home workout as you can avoid inclement weather for walking or running. The gist is that walking or running on a treadmill produces less stress on the body than walking or running on a flat outdoor surface. Most models also offer to monitor the heart rate and blood pressure which can help you determine when it’s time to stop. Generally speaking, the higher you go in price the more potential benefits you will find. A long stride will allow the user to run rather than simply walk providing more cardio benefits. Higher price models may have computerized programs or better cushioning system. To form a workout routine that works for your lifestyle, you only need a few simple pieces of equipment. You can also change your routine, add different workouts to your routine, or add different equipment at a later date without breaking your budget. The estimated cost of my current gym is $496 not including painting and design. When you consider the average gym membership runs about $40 per month ($480 a year), I consider my home gym a total success!